August 17, 1894 marked the beginning of All Saints Parish of Madison Lake when Bishop Joseph Cotter of Winona arrived to complete arrangements for the building. 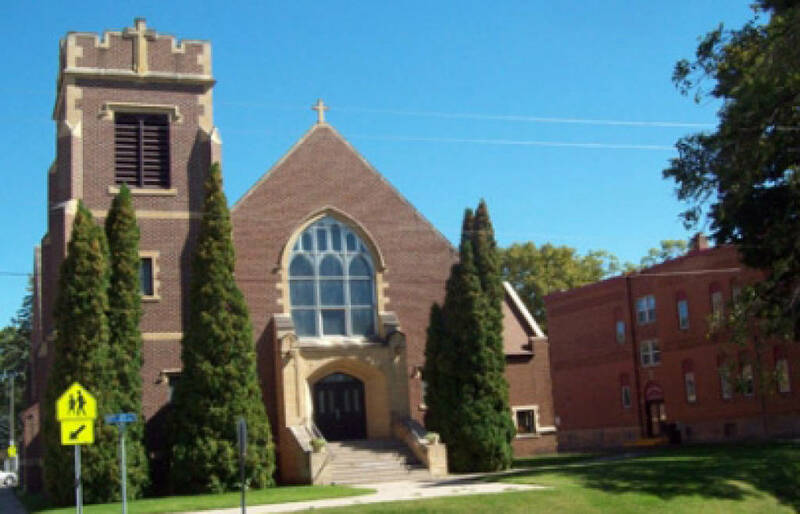 The contract was let for $1997 and the church became known as the German church as opposed to the Irish church of Marysburg in Le Sueur County, just three miles to the north. The German settlers had tired of the long trek north in winter by sleigh. The original wood frame building was 40 by 70 feet and seated 350. Fifty-two families pledged a total of $5000. The first Mass was on Palm Sunday, March 31, 1895. Jesuit priests from Saints Peter and Paul, Mankato served the parish as missionaries for the first 17 years. A school and convent were built in 1907. School Sisters of Notre Dame, Mankato arrived on September 9, 1907. Enrollment was 86 children. By 1911, enrollment was 130. The large bricked rectory, a residence for priests was built in 1911. A high school addition was started in 1921 and completed and opened in 1922. It continued for 13 years. During this same time, the parish expanded and the church building was enlarged and bricked. The new larger church with its brick exterior was dedicated on All Saints Day in 1927. Today, the former All Saints School is now called All Saints Academy and is a state-of-the-art center for caring for young children under the age of 6. Our All Saints Childcare Center serves up to 69 area children each day. Our All Saints Early Childhood Classes for 3 and 4 year olds also serves over 30 children. In addition, nearly 150 children receive faith formation education on Sunday mornings and Wednesday evenings at the the parish. All Saints Parish grounds sits on one of the most beautiful sites overlooking Lake Madison. Through the years the parish has grown and adapted to meet the needs of the families it serves. Rapid growth of the lakes area and the nearby city of Eagle Lake have helped parish enrollment to grow to 430 families. Continued care for the buildings and parish grounds are a hallmark which reflects the generosity and dedication of our parishioners. The church fills with with parishioners on weekends for our vibrant Liturgies and inspiring homilies delivered by Father Schneider. All are welcome!